The Web is full of deception, and it's sometimes still hard for people to figure out if the website they're viewing really is what it says it is. Despite improvements in quickly detecting and taking such sites offline, it's still a huge problem. A U.K.-based network monitoring company, Netcraft, says fraudsters are exploiting weaknesses in technology companies in order to make more convincing looking phishing sites. Many websites use SSL/TLS (Secure Sockets Layer/Transport Layer Security) certificates to verify their domain name and encrypt communications with users. Use of such a certificate is indicated by a green padlock in most browsers, which Web users have been advised to look for when, for example, they're logging onto an online banking service. The digital certificates are issued by Certificate Authorities. Netcraft said fraudsters are obtaining digital certificates from several major CAs -- including Symantec, GoDaddy, Comodo and CloudFlare -- for their bogus sites, making them appear more legitimate. 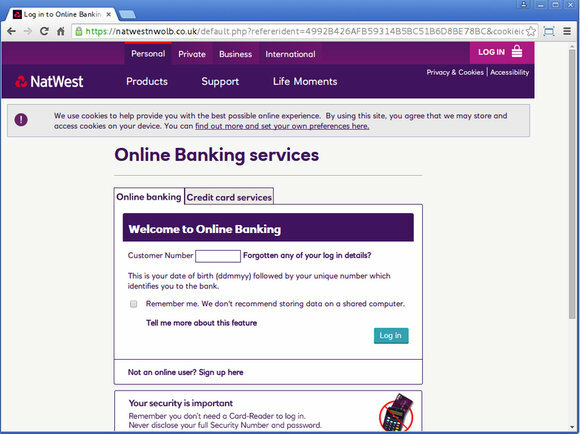 Some phishing sites, like this one spoofing NatWest Bank in the U.K., appear more legitimate by using SSL/TLS certificates improperly issued by digital certificate vendors, Netcraft alleges. Netcraft alleges that it's the fault of the companies for not more closely vetting applicants for domain names that clearly have a scammy feel, such as banskfamerica[. ]com and emergencypaypal[.]net. Throughout August, the company studied certificates issued to suspicious domains. "In just one month, certificate authorities have issued hundreds of SSL certificates for deceptive domain names used in phishing attacks," wrote Graham Edgecombe, Internet services developer with Netcraft, in a blog post. The cheapest kind of digital certificate is called domain validated, or DV. The CAs selling that type of certificate only check that the applicant controls the domain name it is intended for. For more expensive certificates, CAs do a more thorough ID check of the applicant. It's these DV certificates that fraudsters are obtaining. DV certificates are often free or cost less than US$10, Edgecombe wrote. They're also often issued through automated systems, which makes it easier for fraudsters to get them for phishing domains, he wrote. According to industry rules, CAs are supposed to do further verification on potentially high-risk domain names before issuing DV certificates, Edgecombe wrote. Many CAs only send an email to the domain administrator on record before issuing a DV certificate, said Trell Rohovit, CEO of HydrantID, a startup that sells digital certs on a subscription basis. "So essentially a bad guy only has to beat one process/person/or email, and -- puff -- your brand just flew out proverbial Internet window," Rohovit said. Symantec, CloudFlare and GoDaddy did not have an immediate comment. Comodo said it has "the largest share of the problem" due to it being the largest CA, according to an email statement from CEO Melih Abdulhayoglu. Rogue DV certificates are revoked by Comodo when the company is made aware of them, Abdulhayoglu wrote. But certificate issuance is a complex process, and the problem with automated systems (like DV certificates) is that there are no human validation operators vetting the issued certificates," he wrote. A spokesman for Abdulhayoglu said Comodo would not comment further on Netcraft's allegations. Some CAs won't issue DV certificates at all because of security concerns. DigiCert, based in Lehi, Utah, believes DV certificates provide "little value" and that phishing risks could be mitigated by not issuing them, according to its website. Entrust, based in Minneapolis, also doesn't issue DV ones, citing security concerns. "Although the domain validated certificate supports transaction encryption, the end user cannot trust the certificate to confirm who is on the other end," its website says. Netcraft, based in Bath, England, does have a commercial incentive to release these findings: it sells a service, called Domain Registration Risk, which scores domain names and how likely they will be used for phishing. The service is intended for domain name registrars but also could be used by CAs prior to issuing a certificate, Edgecombe wrote.